Inevitably there were some language and cultural barriers that were difficult for some of the group. Some of the more political subject matters in particular were not commonly spoken about in everyone’s context, therefore full participation proved impossible. Bruce from Tokyo shared his feelings, “At times, I was not able to keep up with the fast pace of the discussions and fully digest the discussions during the first half of the lab. In all honesty, it took some time to warm up to the environment” (more from Bruce here). We were very aware of this, and tried to reinforce the importance of every voice being heard. Although we all agreed this was important, we never fully solved the problem. This is one of the most important lessons we are taking forward and the one that needs the most consideration. In a group from such varied disciplines, the term Creative Producer was often problematic. There were many self-definitions; Curator, Producer, Placemaker, Academic, Digital Creator, Project Manager. A Producer often encompasses all these roles and is difficult to define, which can result in imposter syndrome despite years of experience. Professional identity was a major question and one that affected everyone, and also echoed some core concerns that exist within our own resident community. The cohort self-facilitated a lively discussion around this theme – the culmination of which was articulated brilliantly by Paula from Sydney, “I don’t care what you call me, just don’t tell me I can’t f*ckin’ do it” (more from Paula here). Reflections on these conversations had a meaningful impact on a number of the group; Michelle from Dublin realised she thinks like an artist (more from Michelle here). Luke from Bristol spoke of an awakening of internal creativity, “It is opening me up to a world where I don’t have to just focus on delivery all the time. Where I can be the creative driver for once. And that will make me a stronger producer for myself and for all the people I work with.” Malaika from Lagos entered the lab with a clear definition of her creative role, but half way through informed us that she was in the process of redefining herself (more from Malaika here). It is an extremely valuable conversation, and one that I am particularly excited to revisit towards the end of our programme. Despite these differences in definition, the group were united in the exhaustive nature of the role of Producer, constantly expected to support and invest in everyone besides themselves. We heard many people speak of the immense pressure they feel being constantly focused on delivery and rushing on to the next project. The impact on mental health was sizeable, and ran deeper than we realised; Louisa from Stratford-upon-Avon reflected, “It was so freeing. Freeing of the mind and spirit; to exist for a period of time without either a written or mental to do list, or any feelings of guilt or worry about the things that were still on it.” Sarah from Manchester shared, “One of the greatest things it was giving us all was time. Time out of the office, away from our desks, emails and endless project delivery – time to see ourselves, and our cities, differently” (more from Sarah here). Though taking three weeks out of their lives for the lab seemed impossible, the impact of having some time to stop, step back and think resonated deeply. We invited Rohan Gunatillake and Rachel Coldicutt to lead a session on resilience and self-care, who reminded us to make time to consider our wellbeing alongside that of the teams we facilitate. The group continued this conversation on the final day in a deeply moving session led by Alice from Brighton on how to articulate and address personal needs, which many of the Producers cited as one of the most meaningful experiences of their time together (more from Alice here). The Producers have been back home for almost two months and several have confessed that it already feels impossible to find brainspace or self-care in their daily lives. It is clear that this exploration of coping strategies is one that will continue during our time together, and will be a valuable lesson to share with the wider sector. One of the most poignant moments in the lab occurred when we outlined the next steps when they returned to their cities. 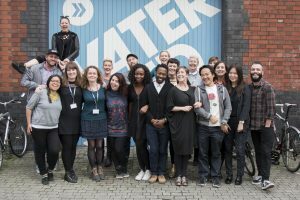 Each Creative Producer will receive a £5,000 Development Grant to begin to explore their ideas for city change over the next year. For many of the group, the realisation that they were to receive funds to invest in themselves, rather than budgets to spend on production costs and other people’s wages, was an emotional experience. For us as the delivery team, this moment above all others solidified the value of what we are trying to achieve. Allowing lots of space in the programme allowed us to programme responsively, which led to a richer variety of content and utilised the extensive knowledge and experience within the group. It also allowed us to respond effectively when inevitably our programming missed the mark. The Creative Producers challenged us on some sessions they didn’t feel were relevant or guest speakers who failed to connect with the atmosphere of the lab. These moments were demoralising, but acting on this feedback was vital for success. The team frequently came together to rethink our approach, often with very little time to formulate a plan. For me, used to meticulously planning film shoots and documentary structures where everything was finely organised, this was a scary prospect. It took a while for me to realise that the fluid process encouraged by the rest of the team was to be celebrated. By really listening and trying to improve we felt the trust in the room grow and the whole process became much stronger as a result. It was important to us to create a culture of sharing both successes and failures in the lab. 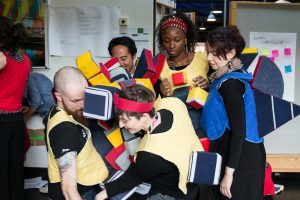 Important lessons can be learned when things do not go to plan, but as well as this it helped us to nurture the culture of openness and trust the group were committed to creating from the very first day. 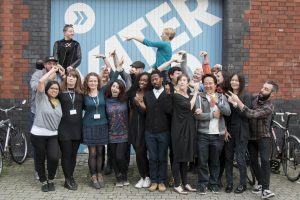 Verity McIntosh shared the very real challenges of bringing Hello Lamp Post to life, and some guest speakers spoke brutally honestly about their own projects that went wrong. Though we watched through our fingers with looks of agonised sympathy plastered on our faces, it was clear that this was a very important part of the process. The acknowledgement between peers that you don’t have to be perfect all the time was a liberating experience for everyone and helped further thaw the imposter syndrome that plagues us all. 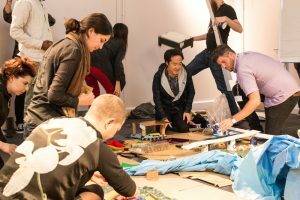 On the penultimate day of the lab we held our Making The City Playable 2017 conference. It was the first public event of Creative Producers International and an important learning moment. We asked the Creative Producers, in small groups, to design playful interventions for our conference delegates in different locations throughout the centre of Bristol. The collaboration within the teams and the ideas they produced demonstrated everything that was so brilliant about this group of people. Despite having relatively little time to work with, they drew on their individual talents and lessons from the lab to create varied and fascinating experiences. 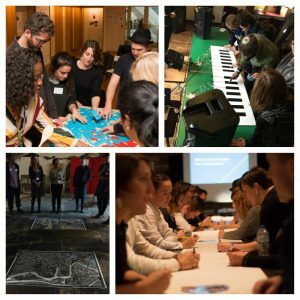 The delegates challenged their perceptions in debates around play and cities, reimagined forgotten or obsolete public spaces, experienced an aural journey through the past, present and future and imagined what that city would sound like if it had its own voice. The sense of accomplishment the activities achieved was fantastic, though on reflection the time may have been better spent continuing valuable conversations cut frustratingly short due to constraints on time. One of the best things the lab achieved was the bond that grew steadily within the cohort. Jo Lansdowne put it brilliantly when she reflected that by the third week the energy levels and reactions of the cohort seemed to move as one. 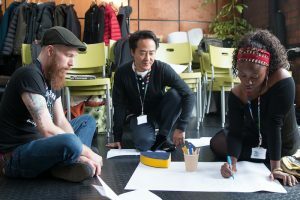 Although we planned workshops and activities to begin this process, allowing the space and time for the Creative Producers to explore, learn and share with each other was far more valuable for this. The care, support and celebration of each other that has continued beyond our time in Bristol (and is evidenced every day in our WhatsApp group) was more than we could have hoped for and has made this experience something really special. The cohort have now flown the nest back to their own cities to begin working on their proposals for the next stage of work. Though there was a genuine sense of grief that the lab experience had come to an end (something we all shared tips on dealing with on the last day), it felt clear that this wasn’t the end of our journey – it is just the beginning. The lab was a great success and we have already had our first ideas for city change through from the group. There are many new challenges to come, including maintaining the momentum and sense of community within our cohort now we are spread throughout different time zones across the world, but with the imposter syndrome inside my own head firmly ignored (for now), I couldn’t be more excited to see what comes next. “This experience truly inspired me to be a “Creative Producer” of my city and to stay focused on why I started my company.” – more from Ryan, Tampa here. “It’s like having a super change maker that has 15 different super powers… experimenting does not feel lonely anymore, learning from mistakes does not feel like a one-woman struggle, and thinking different feels like a challenging mist of joy!” – more from Leticia, Mexico City here. “I really needed regular access to colleagues and advisors who had a more global perspective on phenomena like power and identity, who foregrounded social justice and inclusion in their practices, and who understood that the pursuit of these values should often be joyous and playful. I found those people!”– more from Sarah, Copenhagen here.